On a trek through the forest, you hear a “coo-coo-coo-coo-coo”. You look up to the sky and perched upright, wide-eyed and mysterious, is the most beautiful yellow- bellied bird. You can see its purplish-blue head and chest and its dark green back which changes to blue on the rump. The large white tips on the tail feathers and pale blue eye ring confirm its identity. It is the Green-backed Trogon, one of three species of Trogon found in Trinidad. You may know this bird by its former official name, the White-tailed Trogon. 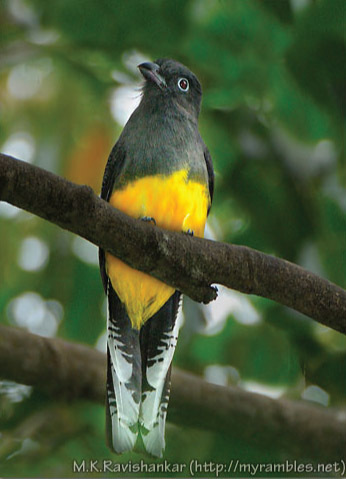 The White-tailed Trogon existed from Panama to Brazil but recently this species has been split. Those found west of the Andes remain the White-tailed Trogon while the birds east of the Andes are now called the Green-backed Trogon. These newly identified species were found to have different plumage, vocalisations and DNA. family, the Green-backed Trogon has short legs, short beaks and graduated tails. The female is a duller version of its mate. At 11 inches it is larger than a similar- looking species also found in Trinidad, the Violaceous Trogon. either found alone or in pairs and will nest in cavities in tree trunks or in termite nests where clutches of two to three eggs are laid. Trogons are ventriloquists of the forest, often deceiving humans into thinking that they are somewhere they are not. When their series of notes, normally done about 6-15 times, is done softly they often convince persons that they are far away. Less often they may cluck or churr. When the Trogon takes leave of you, you will witness its dipping flight, the tail waving as it moves away.